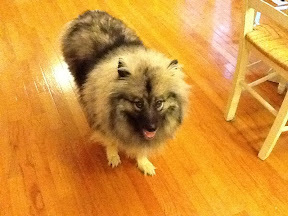 I don't understand Makayla, my Keeshond, sometimes. Like this morning for example. I wanted to sleep in and enjoy waking up slowly and leisurely in the morning in bed. Maybe I think I had visions of even sleeping in until 8 or 9 am. Makayla, however, wanted to play and made sleeping impossible. 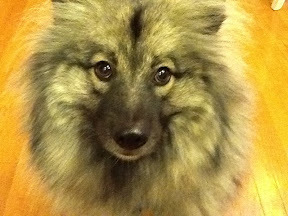 I looked at the clock which was blinking 6:30 and realized that on a normal morning, the dog would be crawling back onto the bed for a few extra minutes/hours of shut-eye. Why not today, I wondered? Alas, it was not to be--and for some reason, she has been glued to me, it seems, for the past hour. I think she has missed me and she somehow senses that today, I am going to be around at least for the morning. And it really isn't so bad to have a dog that wants to be part of rather than a spectator of life. I know some people who probably need to engage a bit more. And so the weekend is off and running. I'm already on my third cup of coffee and the dog is walked, fed, and has two doggie treats in her. Maybe I'll sit here and watch the Today Show for some amusement.